Create a functional storage space behind those decorative panels with the new base filler cabinet line. Rev-A-Shelf didn't just create another organizer... they created the whole cabinet that transforms filler pieces into useful storage pull-outs. 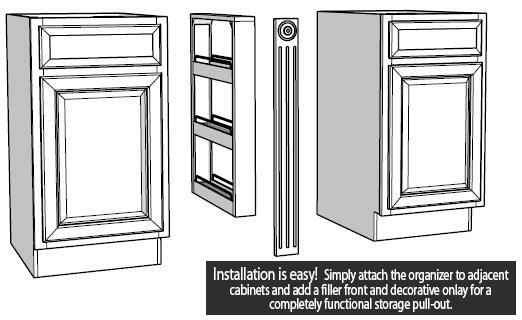 With these different options available in the base cabinet fillers you are sure to find a storage solution to suit your needs. 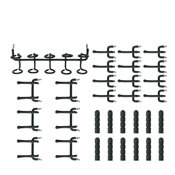 The standard base cabinet fillers are available for 3", 6", and 9" base cabinet applications. Featuring adjustable shelves with chrome rails, full-extension ball bearing slides, and the three slide design providing for the most stable cabinet filler on the market. The 434 Series of Base Cabinet Fillers feature full-extension ball bearing slides, black accessory hooks and pegs, and stainless steel panels that provide endless storage customization- from storing pots and pans, cleaning accessories, various cooking utensils, keys, craft supplies and much, much more. Now you can have the best of both world's with the innovative 433 series. The 433 series is designed to turn the wasted space behind decorative fillers into functional storage by offering both 2 3/4"W shelves with chrome accents and a stainless steel panel that comes with an array of accessory hooks that you can use to customize your storage needs.